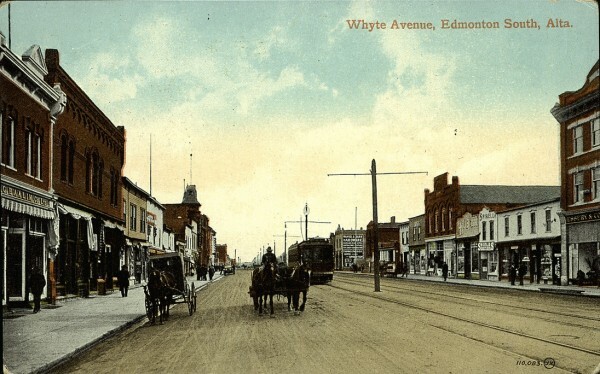 ca 1910 - PC014144: "Whyte Avenue, Edmonton South, Alta." Image courtesy of Peel's Prairie Provinces, a digital initiative of the University of Alberta Libraries. 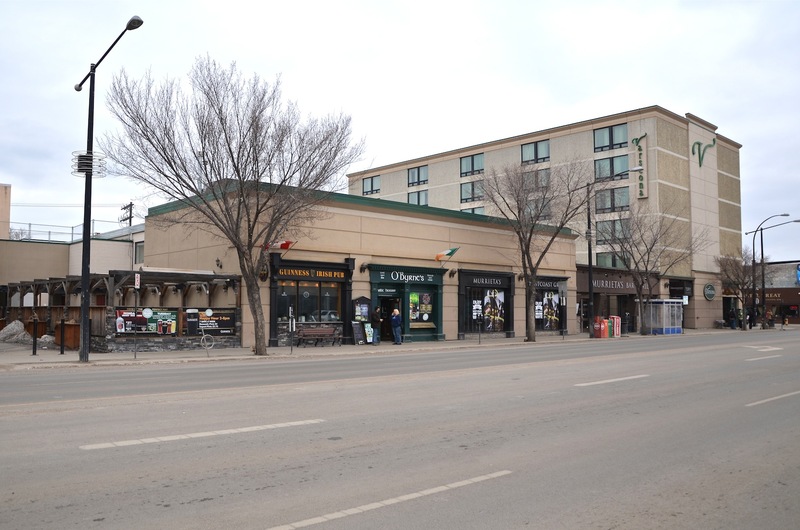 2013 – Whyte Avenue a century later at the corner of 104 street facing East. There’s just something inexplicably cool (to me) about seeing a photo of a horse drawn carriage filled with a moustachioed brass band circa 1907 lounging outside of the building where you drink your coffee and check your emails each morning. Maybe it’s our country’s youth, our collective desire to time travel or possibly our need to experience a bit of history in a place we have an actual connection to (I’m leaning towards time travel)? Whatever the reasons, I just love seeing historical photos and images of places that I know and love juxtaposed with their current condition and I’ll be sharing some of my favourite ‘historical spaces’ with you. 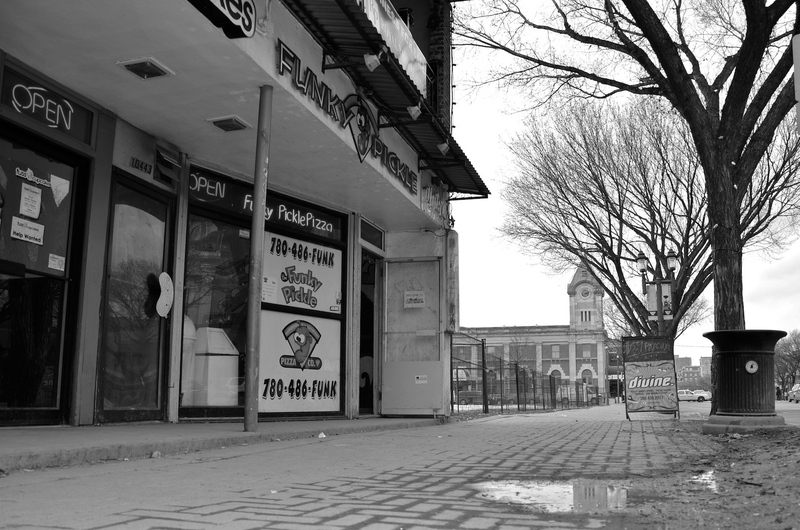 This first group of shots is from historic (and currently quite vibrant) Whyte Avenue. At the top is a postcard printed in Great Britain in 1910 for the Valentine and Sons publishing company followed by the same streetscape a century later. Below is a shot from 1913 with the iconic Strathcona Hotel in the front right built in 1891 to service the End of Steel railroad terminus across the street and the vital blocks of retail buildings surrounding it. Many of the buildings in both images can be recognized in the present day photo but unfortunately the streetcars were removed in the 1940’s. 1913 – Photo by McDermid Studio. Strathcona Hotel in right foreground. Image from the City of Edmonton Archives © EA-10-277. 2013- Whyte Avenue with the Strathcona hotel in foreground. The second set shows the evolution of the South Edmonton Post Office building and its neighbours, which now includes a large undeveloped site where the Raymond Hotel once stood. A gas station was removed from the lot in 1998 and a lengthly remediation process ensued, since June 2012 the site is now clean which has spurred residents into enthusiastically speculating about new developments. 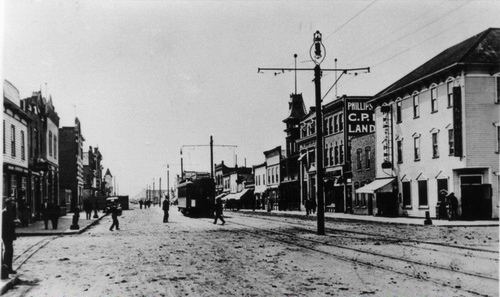 1913 – Photo by Frank Crevier of the Raymond Hotel and the South Edmonton Post Office in background. 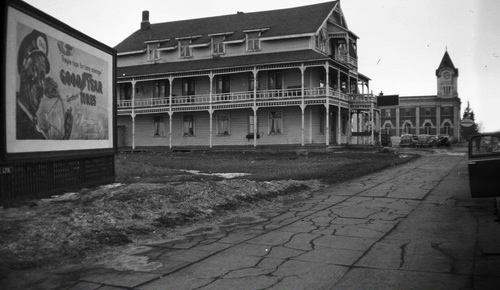 Image from the City of Edmonton Archives © EA-787-1. 2013 – Retail building with adjacent empty lot and Post Office in background. 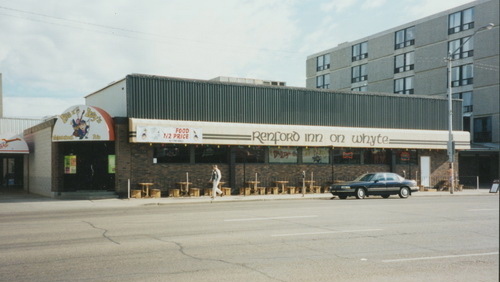 The Renford Inn and The People’s Pub were a Whyte Avenue fixture until the mid/late 90’s when the building transformed into the Varscona Hotel and O’ Byrnes Irish Pub, developments that have been viewed as both catalyst and template for the design direction Whyte Avenue has taken since. 1995 – Photo by Phil Cox, Renford Inn and The People’s Pub. Image from the City of Edmonton Archives © EA-207-709. 2013 – Varscona Hotel and O’Byrnes Irish Pub est. 1998. Neat compilation of photos throughout time, Kurt! The outdoor seating at the Redford Inn looks like a great addition to the street, although I wonder if it would have been noisy from the traffic passing by. Was it easier to include outdoor seating/patios more easily in the 1990s compared to today? Thanks Stephanie, I think there weren’t as many places that needed outdoor seating before the big shift (to more restaurants cafe’s and bars on Whyte), but I’m sure patio seating was an issue then as well. I was inside the People’s Pub (a few times) but I don’t think I ever sat on the ‘patio’. Maybe some readers could comment on your question? Love this comparison. I’ll be watching for these posts whenever you do them. Time travel, indeed! I didn’t know about the Raymond Hotel. The guidelines the City uses to approve (or deny) patio applications haven’t changed since the ’80s, I don’t think (maybe time for a rewrite?). One challenge is creating a practical patio while maintaining enough sidewalk space: restaurants or bars like to have enough space to move around the tables, and the City needs to maintain at least 2 m of walking width, so achieving both can be difficult even on Whyte where the sidewalks are wider than they are on most streets. The other big challenge is providing adequate parking. Even though patios are seasonal, the City expects parking to be provided for them on-site. Parking reduction variances can be requested, but it’s a lot of hoops to jump through and can give your neighbours cause to appeal the decision. The parking issue is probably the biggest impediment, but no one has championed a change to the regulations yet. I LOVE(!!!!) what you are doing here. I’ve been hanging out on Whyte since I could take the bus back in jr. high in the mid-80’s. I’ve been scouring the ‘net for older pics of whyte and am glad I found your page (I keep hoping to find more from the 80’s but no luck yet). I’ll be coming back to see what else you come up with – keep up the great work, Kurt. What a great compilation. I’m reminded of how young we are as a city and totally enjoyed the then and now. I too loved the look and practicality of the street car. Awesome compilation Kurt! Really enjoyed it. Nice study, Kurt! It intrigues me also how photographs of the past, when paired with a photograph from the present, creates a sort of portal through which one can experience the past. I suppose viewing the photographs separately could evoke the same response, although this would depend on the individual, however it is certainly draws attention to the subtle changes. Have you considered pursuing this further as a sort of installation piece? I did a very similar study for my M.Arch thesis in Banff National Park, pairing photographs of the enemy-alien internment camps at Cave & Basin (c. 1914-1920) with photographs I had taken in present day. I set up a brief installation with an enlarged image (c. 1914) plotted on large-scale acetate, and then sandwiched it between two 4’x8′ piece of Lexan; then I suspended these images at eye-level via a series of C-stands. The result was a life-sized, in-situ filter/portal through which people could stand with the Old Image superimposed over the present-day view. One could stand in front of it, and it would mimic on a public scale what is accomplished through expensive and techno-intensive Augmented Reality system. For a another example of this, I suggest watching Michael J Fox in “For Love or Money.” There is a scene where he does what I have suggested above, superimposing a rendering of a future hotel over the view of a dilapidated building he desired to purchase. Also, if you are so interested, I could send you a copy of my thesis in pdf. They are looking for all kinds of ideas and I think your project would fall well into the scope of what they are doing – and you might even be able to get a little cash to help you continue your work….BONUS! 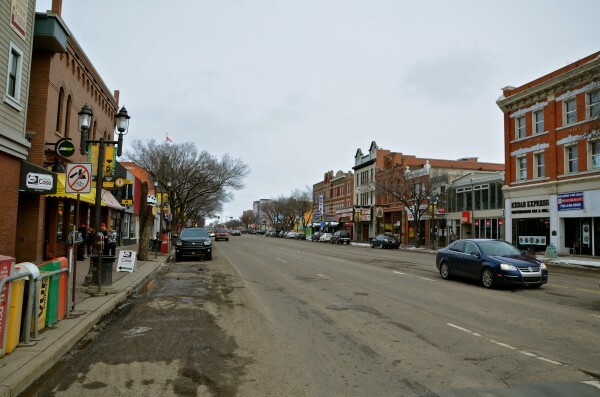 I’d love to see further chapters chronicling the history of Whyte Ave.
Great to see someone tackling this! 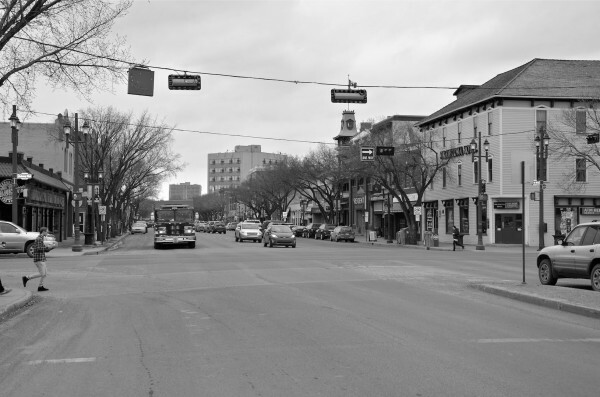 Whyte is a nice first subject, since it hasn’t been gutted in the way Jasper Ave has been. It really is painful to see what we lost, there. I’m planning on doing quite a bit of rephotography myself as the weather gets nicer (having already amassed a selection of archive images to re-shoot), and I’d gladly contribute to this feature! And the commentary that can be created through a critical collage of the two eras in photoshop can be very powerful, so a big part of whatever I do will emphasize that. Regarding the Varscona Hotel, formerly the Inn On Whyte, I was reminded recently that the commercial spaces along the Ave are housed in the former showroom structure of the Shirley Ford car dealership. See? We don’t demolish everything and we were already recycling 40 years ago.